Do you need help with understanding the different types of ID card printer ribbons? The type of ID card printer ribbon you’ll need will depend entirely on your printing requirements. Card printer ribbons are available in either monochrome or full colour. If you are printing in only one colour such as black, then a monochrome ribbon is perfect. If your design contains two or more colours, then you will need to opt for a full-colour ribbon. Let’s start by looking at the standard ribbons used by most Direct to Card (DTC) printers. They are available in many different sizes to fit all kinds of printer models from a whole range of manufacturers. Probably the most popular and versatile of all the printer ribbons, the YMCKO offers four colours with the added extra of a protective overlay incorporated into the ribbon. Their main feature is the clear coating overlay which gives your finished cards extra protection against abrasions or tampering, making them the perfect choice for cards that will receive a lot of handling or which contain secure information. YMCKT ribbons work in the exact same way as the YMCKO ribbon above the only difference is the (O) is replaced by a topcoat (T) panel. If you are looking to print dual-sided cards with colour on the front and black text or barcodes on the reverse then this ribbon is suitable for the task. Please note that with this type of ribbon, a protective overlay is added to the front of the card, but not the contrary. Half-panel ribbons are available in YMCKO, YMCK, YMCKOK and YMCKK formats and are ideal for creating photo ID cards where colour is only required to be printed onto one half of the card. You can add an image or logo onto one side of the card, and print in full black text onto the other side of the card. By using a half panel ribbon, you will save money on ongoing consumables but are restricted to the print area on each card. Monochrome ribbons are ideal if your card design contains one single colour with no shading. Black monochrome ribbons are popular when adding barcodes or text to the reverse of the card such as “If found, please return to”, while colour monochrome ribbons are more commonly used to adding to pre-printed cards. In some instances, you may see options to purchase a BO or a KO monochrome ribbon. B stands for pure Black, ideal for printing barcodes and K stands for composite Black which is a mix of combined colours to form the Black, more suited for printing detailed text. If you are printing using a retransfer printer such as the Fargo HDP5000, or the IDP Smart 50L which is a card printer with a built-in laminator, then it is imperative that you select the correct ribbon. Retransfer and lamination ribbons never have an overlay panel as this protective overlay is added with a separate retransfer film during the lamination process. When ordering a retransfer ribbon, please check to see the compatible retransfer film as you will need to purchase both at the same time. This retransfer ribbon can be used to print full-colour single-sided cards with no black text or images. These are the four colours that can be combined to enable you to produce all the colours in the visible spectrum. Create vibrant, full-colour images and black text on a single-sided card, ideal for printing photo ID cards. If you’re printing using a dual-sided retransfer printer then this ribbon will allow you to add full-colour images and black text to the front of the card, and black text or barcodes on the back. Opting for this ribbon allows you to print full-colour single-sided ID cards with black text or images only. The Inhibitor Panel (I) prevents the design from being printed on specific parts of the cards, such as a signature panel or RFID chip, ensuring they work properly. If your card design includes a section where the user is required to add a signature, then you will need this type of ribbon. The ribbon includes a semi-opaque or clear panel that makes the card writable. Membership, discount and loyalty cards often require members to sign their cards so this ribbon type will complete the job for you. UV or Fluorescent panel ribbons are used to add images or text to ID cards that are only visible under ultraviolet (UV) light, ensuring any cloned or duplicated attempts can be easily spotted. Once you understand the types of ID card printer ribbons, you can choose the right ID card printer ribbon for your printer. The ribbon you’ll need to use depends on the type and make of the ID card printer you’re using and what design you want to print onto your cards. There are two types of ID card printers. Firstly, you need to work out which one is yours. Direct-to-card printers (also called dye sublimation printers) are the most common type of ID card printer. They print the design directly onto the card and leave a small white border around the edge of the card. They generally offer faster print speeds and have a lower cost per card than retransfer printers. Retransfer ID card printers are specifically designed to offer a higher print quality and have the ability to print over cards with uneven surfaces such as RFID cards. Retransfer printers print the design onto the ribbon which is then adhered to the card with heat. If you’re still unsure of the type your ID card printer, look at the printer box, an old invoice, or write down your serial number and give us a call on 0161 988 2095 and one of our card printer experts will be able to assist you. Once you know the type of ID card printer you own, next, you need to look at the make and model of your ID card printer. Each brand has its own card printer ribbons for each model of printer, and you must use these in order for your printer to work correctly. If you try to use a ribbon from another printer brand or a non-genuine ribbon, it won’t work properly or fit into your machine. To make this clearer, we have a page listing the different card printer brands and the ID card printer ribbons for each model of printer. Don’t forget to check with your supplier that any ribbon you purchase is a genuine ribbon. Step Three – What Type of Card Do You Want to Print? Once you’ve worked out the type and make of your ID card printer, you then need to decide what you want to be printed onto your cards. Do you want to print on one or both sides of the card? Do you want to print a photo ID card with a full-colour image and black text? 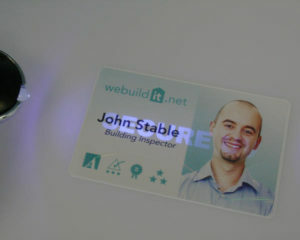 Do you require visual card security with the use of UV? Do you want to print cards in a single-colour/monochrome? Once you have decided on the design you want to print, you can simply pick the ribbon with this capability and one that matches your make and model. To learn more about which ID card printer ribbons are compatible with your machine, download our free ‘ID Card Printer Ribbon Buying Guide’ or contact us.